HomeBible Study Helps & Family LivingFamily LifeI'm a Grandparent! Now What Do I Do? Don't be misled by the title. This book is written for you, homeschool mom. When you were a young girl, didn't you dream of growing up to become a mommy some day? Didn't you play with dollies and practice your parenting skills? What about now? Do you ever dream of the next season of life? Of being a grammy? Do you ever wonder how you can practice to equip yourself to be an effective grandparent that will pass on a legacy of the gospel for your grandchildren? The problem is that American philosophy of the retirement years has completely robbed this most-important season of life from any meaning or value. Don't be misled by the title. This book is written for you, homeschool mom. When you were a young girl, didn't you dream of growing up to become a mommy some day? Didn't you play with dollies and practice your parenting skills? What about now? Do you ever dream of the next season of life? Of being a grammy? Do you ever wonder how you can practice to equip yourself to be an effective grandparent that will pass on a legacy of the gospel for your grandchildren? The problem is that American philosophy of the retirement years has completely robbed this most-important season of life from any meaning or value. The retirement years have become almost more self-serving than the typical teen years! Slogans like, "I am spending my kids inheritance," and "Me? Babysit? I already did my time," abound. Yet God has placed a call on our lives that doesn't decrease with time, but increases in it's holiness, usefulness, value, responsibility, and impact. 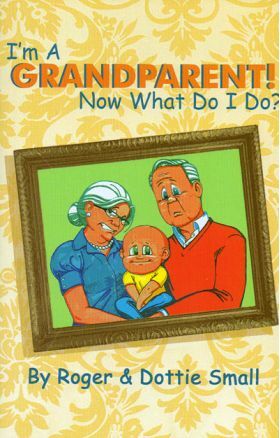 It's gospel-centered grandparenting. I'm a Grandparent! Now What Do I Do? is designed for you, homeschool mom and dad, to prepare for the next season of life! I can't tell you how much this little book has already impacted me! Written in story form, Roger and Dottie tell the story of their own season of growth and grandparenting - and without being preachy (simply sharing their hearts) they manage to get across a HUGE lesson. I truly believe this message will be the next major move of the Holy Spirit in His people as the older generation gets a vision for what God has for them! Oh, and I have the privilege of knowing Roger and Dottie personally and can testify that every one of their children and grandchildren are following the Lord. What a legacy! Now, I've already been blessed with my first grandchild, and I know God has much more in store for me than to outdo the other grandparent with Christmas and Birthday presents! What an exciting time of life! You will be blessed, encouraged, and equipped by this simple little book!